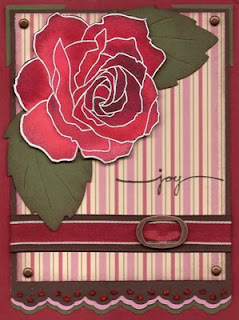 I layered this rose on Riding Hood Red, Always Artichoke, Chocolate Chip and a sheet from SU's Candy Lane ds. The leaves are cut out with the Big Shot using the Big Leaf die. The layered ribbons are SU's 5/8" chocolate grosgrain and the Riding Hood Red taffeta ribbon. The bottom edge was cut using the eyelet border punch on Chocolate Chip, Always Artichoke and Pretty in Pink cs. I layered the edges and glued clear dark red beads from the Bead Duos in the eyelet "holes" in the Chocolate Chip Layer. The beads are very striking IRL!